At the 2000 millennium it was stated that the recruitment to traditional/folk dancing in Norway was threatened. This was also the conclusion in a report “On Folk Music and Folk dance in late modern Norway”, in 2001 (Georg Arnstad 2001). The message of the report was to professionalize, modernize and renew traditional dancing in order to safeguard it as such. The Norwegian Centre for Traditional Music and Dance (Sff) applied for governmental funding of a massive and ambitious action. The mission was to safeguard traditional dances in accordance with a complete new model: An ambulant school for teaching young traditional dancers to become professionals, and for innovative stage performances. National folk dance revival organisations were co-partners. It should comply with the Arts Council professional standards, concerning visual and artistic quality. It should be acceptable to the politics of the Norwegian Centre for Traditional Music and Dance, namely, in short, safeguard the traditional dance heritage. It should be acceptable to the revival folk dance organisations: namely recruit new performers and strengthen social dancing. 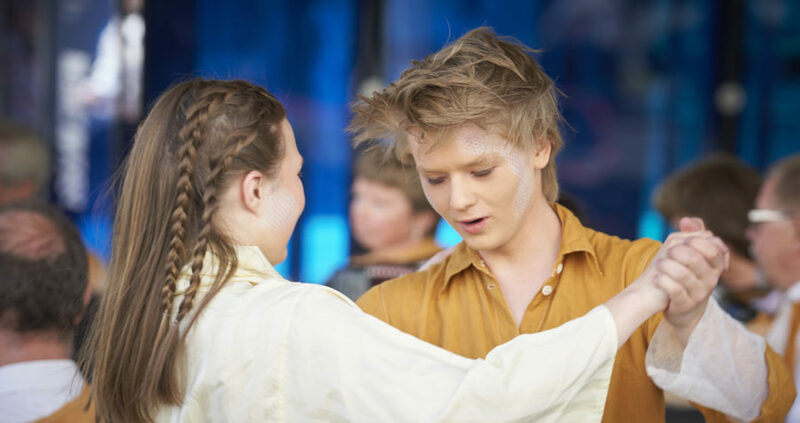 These conditions did not only enable the funding, their combination reflected and enabled safeguarding as a contemporary act making traditional and folk dance vivid for the present youth generation. Bygda Dansar (the Countryside Dances) has become a successful outcome of these conceptual measures. Establish meeting arenas between the youths, the local traditional dance milieu, professional folk dance teachers and the dance archive. A teaching tour in high schools provides and recruits youngsters (14-19 years old) to the project. The project welcomes both already established young folk dancers and youngsters without any experience prior to folk dance. Bygda Dansar “Snu Nordvest” runs a teaching program at a highschool in Ålesund (county of Møre og Romsdal 2004). Photo: Laila Urke. After recruitment, all the youngsters meet a weekend every month/second month (due to geographical distances) for practicing dance preferably in connection with social dance gatherings. In between they dance in smaller groups with local dance teachers and musicians. Social dancing at Hugnadheim, Torpo in Hallingdal (county of Buskerud 2009). Hugnad Ungdomslag in cooperation with the Bygda Dansar project “Danseru”. Photo: Marte Frihetsli/ SFF. In the mid of the 3-year project the youngster do an “intermediate” staged performance. This performance has as its main aim to motivate the youths to secure good quality in dancing. The traditional dance “as it is”, is presented in an artistic or thematic perfomance. The idea, i.e. for the “intermediate” staged performance in Bygda Dansar Akershus (2016) was identity, the proudness of individual identity (solo dancing) and district identity (group dancing). The solo performance aim was to encourage and value independent dance styles. The contemporary dance choreographer Marie Bergeby Handeland was engaged with how the values of social dancing could be kept also as a staged performance, without turning the dance into a show, or a narrative story. She challenged the participants to dare to make it simple, to dare to give certain elements time and duration and to create a common concentration and a common seriousness among the youths. Here are some glimpses from the performance where also a few youths tell why they invest their spare time in Bygda Dansar. After the “intermediate”, staged performance, the weekend and local rehearsals continues. The 3-year project ends with a huge staged perfomance where artistic criterias together with traditional criterias form the basis of the innovative dance art. Sogn og Fjordane (2001-2004): “Fjordapuls”. Møre og Romsdal (2004-2007): “Snu Nordvest”. Rogaland (2016 – ): “Rogalender”. The professional folk dance teachers have time, energy and the pedagogical tools for recruiting youngsters. They bring the tools for cooperation with dancers from revival movement to revitalise the dance traditions based on the living tradition and film documentation of traditional dancers and musicians. The analysis of plural understandings of the local dance traditions is transmitted to the youngsters. Cooperation with local heirs; dancers and musicians from the area were the youths belong are brought into the project to play, teach, dance, make social dance gatherings and to make sure that the youths are welcomed into the folk music and dance movement. Bygda Dansar works with the techniques and aesthetics from the traditional social dancing, also in their staged performances. It is an aim to keep the diversity of human body builds and the dance characters: solo and couple dances with rhythmic footwork with their belonging to traditional music. This uncompromised attitude secures that the youths embodiment is grounded in the traditional social dancing and not in the staged versions. Youths evaluation tell us that they love the staged performances. The staged perfomances makes them work seriously with the traditional dances from their area. The professional staff secure high level dancing – and high level performances. Good recruitment strategies, good strategies of creating good social milieus for the youths makes them engaged in the project. Through dancing, youth milieus become established in their home counties. In the national arenas these local milieus meet and establish a shared milieu for traditional dancing nationwide. In each county youths from Bygda Dansar continue dancing or teaching in their own home milieu, in national festivals and some even call on higher education in the fields of dancing. Several of the youths in earlier projects are now working either as folk dance teachers, as professional dancers or as dance archivists. The Norwegian Centre for Traditional Music and Dance (www.fmfd.no) aims to promote, safeguard and transmit traditional music and dance as an expression for cultural identity and carrier of unique qualities. The centre includes one of the largest archives of North-Europe of traditional music and dance. The archive consists of films, videos and sound recordings from early 1900 until today. The archive is basis for research, education, transmission and revitalization.